At age 30, both college-educated men and college-educated women have experienced wage growth of almost exactly 60 percent, compared to what they earned at age 22. 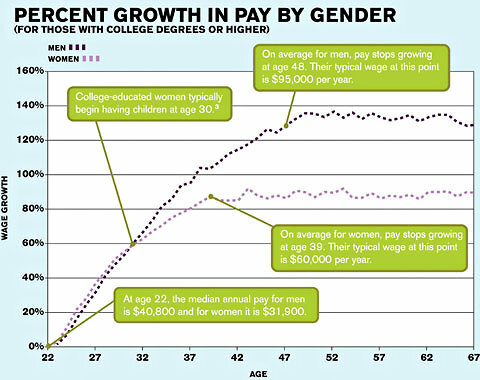 The typical 30-year-old male college grad working full-time receives $65,300 annually, and his female counterpart receives $51,000. Then, at age 30, college-educated women are likely to start having children. Not coincidentally, that’s also when women’s earnings growth starts to slow. Meanwhile, men’s earnings growth remains about steady. I’ve been away the last couple weeks moving into our new home – while only 1/2 mile away from our townhouse, it was still a big undertaking! Anyway, will be getting back to regular posting this week. See you soon! This entry was posted in Uncategorized on May 29, 2012 by coronino. A Work Trends study just released by Rutgers University paints a gloomy picture for this month’s college graduates. Despite encouraging news by some, these findings show that only half of the college graduates interviewed had full-time jobs. Furthermore, most graduates characterized their current positions as either a “stepping-stone” or a “to get by job.” A good study which shows the reality of our transitioning economy. And of course, there’s also that certain little issue of college debt. This entry was posted in Uncategorized on May 15, 2012 by coronino. While Latinos make up over 15 percent of the U.S. population, they account for only 3.6 percent of the doctoral degrees awarded in the United States. Dismal I know – and increasing these number will require a long term vision. But we’re starting to make strides. Read the inspiring stories of three Latinas who took the journey and received their PhDs over the weekend at the University of Texas at San Antonio. This entry was posted in Uncategorized on May 14, 2012 by coronino. Why Are Organizations Afraid of Diversity? We’ve got to move the needle. Sometimes you’ve got to be an advocate for diversity and not be afraid of that. And I think the AICPA … can continue to have a loud voice on this issue, and I want them to continue to speak loudly and continue to push, continue to agitate. This entry was posted in Uncategorized on May 11, 2012 by coronino. I couldn’t agree more with his thoughts. When you consider that each of these reasons is impacted by the emergence of social media – it’s a more salient point. Why? Because we now have the ability to pull back the curtain and get a first-hand account of each item on the list. Is “blank organization” really one of the “Best Places to Work?” or is it just a marketing scheme? Pls. share. If experiences don’t match the company message – organizations will have challenges. Potential employees indeed now have a choice. This entry was posted in Uncategorized on May 9, 2012 by coronino. Big kudos to the National Hispana Leadership Institute (NHLI) on its 25th Anniversary. In partnership with Harvard’s Kennedy School, the organization was established to address the under-representation of Latinas in the corporate, nonprofit and political arenas. This entry was posted in Uncategorized on May 7, 2012 by coronino. For young college graduates, the unemployment rate was 10.4 percent in 2010 and 9.4 percent over the last year, while the underemployment rate was 19.8 percent in 2010 and 19.1 percent over the last year. Graduating in a bad economy has long-lasting economic consequences. For the next 10 to 15 years, the Class of 2012 will likely earn less than they would have if they had graduated when job opportunities were plentiful.